Buffalo Wild Wings provides three simple things to diners: wings, beer, and sports. 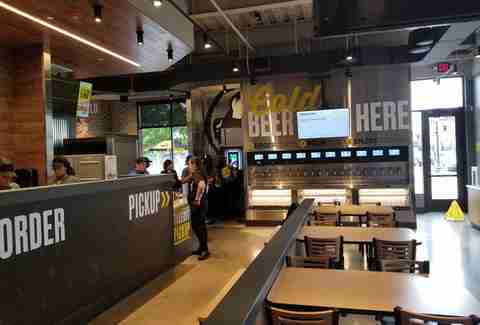 With more than 1,200 restaurants carrying its name, B-Dubs is testing a new concept that opened earlier this week. It basically cuts out one of those to get to the other two more quickly. It's called B-Dubs Express. There are still flat screens, but sports take a back seat at the wing slinger's new pilot restaurant in Minneapolis, Minnesota. The focus is on quick service and wings to go. However, B-Dubs Express offers something a little different as well. The food is, well, the food. It's the same replicable wings you already know. The big difference is the addition of a sauce wall and self-serve beer. 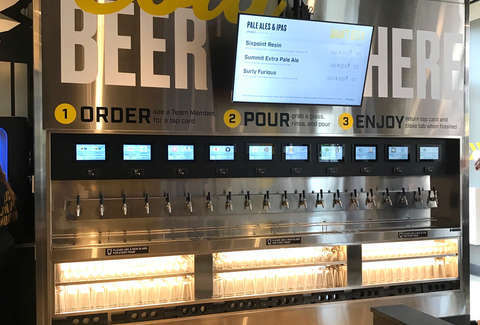 The big, eye-catching attraction is the 20-tap self-serve beer wall. It's the first of its kind at a Buffalo Wild Wings, and it provides a wealth of styles to sample with a focus on local breweries. Todd Kronebusch, BWW’s VP of Off-Premise Dining and New Restaurant Formats, told Thrillist the company has a couple of national brands that are standard across the company, but then the location is free to give its selection a little character. This wall features local favorites like Surly, Indeed, and Fair State, in addition to taps for margaritas and an overly sweet concoction called Buffalo Zoo. You only pay for what you drink at the wall. So, get a taster of Roselle and Lucy Session Sour if you want to find your favorite. Have half a beer over your lunch break. Or be the disgusting person at your table that pours a little margarita in your stout. You're the god of the beer wall. No one can tell you what to do! At least, until you knock over an entire row of glassware because yes, there is actual glass on shelves next to the self-serve beer wall. It's the Justice League 2 of fast-casual dining (it's a guaranteed disaster). The concept is fun for a fast-casual experience. Though, representatives say not to expect the Express template to roll out across the nation anytime soon. There are currently three B-Dubs Express locations, all in the greater Minneapolis area. This is the first one with a sauce and beer wall.